Amid a confluence of messages regarding accountability, the Common Core State Standards, teacher effectiveness, and student performance, educators everywhere are looking for ways to revitalize their curriculum design and instructional practice. Upgrade Your Curriculum: Practical Ways to Transform Units and Engage Students offers a solution: providing students with meaningful, relevant units of study developed by the educators who actually teach them. 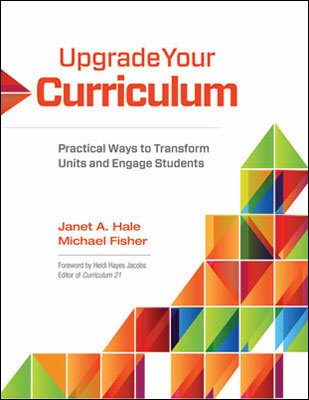 The authors, both curriculum experts, advocate a gradual approach to transforming curriculum in which teachers work collaboratively to upgrade one unit at a time. Address the foundational concepts involved in transforming curriculum. Introduce their innovative transformational matrix--an essential visual reference that classifies upgrades according to their effect on student learning and engagement. Outline the four phases of the collaborative transformational process: appraisal and brainstorming, commitment and communication, reactions and reflections, and revisions. Explain how to create units of study that engage students in higher-order thinking, authentically incorporate technology and web-based tools, and align with the Common Core. Present transformational snapshots that reflect how real practitioners across all grade levels and subject areas have upgraded curriculum and instruction and increased student ownership of learning. If we view curriculum and assessment choices as indicators of the direction in which our students are heading, most of us would agree that they’re currently traveling back to the 20th century. Clearly, we need to collectively step up our curriculum. This indispensable guide offers strategic, practical knowledge that will enrich your school's curriculum mapping efforts and help you create authentic, engaging learning environments that prepare students for the future. JANET A. HALE is an educational consultant who specializes in curriculum mapping, standards-based curriculum design, and transforming units of study. She travels extensively throughout the United States as well as internationally. She enjoys introducing curriculum design and curriculum mapping to newcomers, supporting implementation, aiding struggling initiatives, and advising those ready for advanced curriculum work. She has written two books focused on curriculum mapping, including A Guide to Curriculum Mapping: Planning, Implementing, and Sustaining the Process and An Educational Leader's Guide to Curriculum Mapping: Creating and Sustaining Collaborative Cultures, both published by Corwin Press. MICHAEL FISHER is an instructional coach and educational consultant specializing in the intersection between instructional technology and curriculum design, which he calls digigogy: a new digital pedagogy. He works with districts across the United States to help schools and educators maximize available technology, software, and web-based resources while attending to curriculum design, instructional practices, and assessments.